Surprise a special someone with this beautifully presented gift box. Open and you will find a 24" crystal clear deco bubble balloon filled with lots of little colourful 5" balloons. The balloon is styled with our hand made tassels and satin ribbon and set from a bubbly decorated weight inside the box. 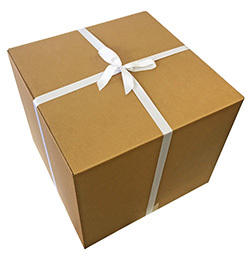 Any additional goodies (chocolates, wine etc) can be placed inside the box, however any additional Balloons won't fit inside so will be displayed outside the box.